Campaign for the American Reader: Pg. 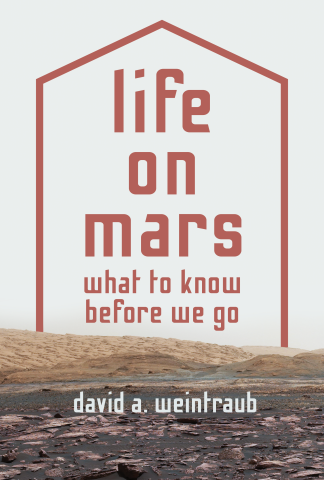 99: David Weintraub's "Life On Mars"
Featured at the Page 99 Test: Life on Mars: What to Know Before We Go by David A. Weintraub. David Weintraub tells why, of all the celestial bodies in our solar system, Mars has beckoned to us the most. He traces how our ideas about life on Mars have been refined by landers and rovers, terrestrial and Mars-orbiting telescopes, spectroscopy, and even a Martian meteorite. He explores how finding DNA-based life on the Red Planet could offer clues about our distant evolutionary past, and grapples with the profound moral and ethical questions confronting us as we prepare to introduce an unpredictable new life form—ourselves—into the Martian biosphere. Life on Mars is also a book about how science is done—and undone—in the age of mass media. It shows how Mars mania has obscured our vision since we first turned our sights on the planet and encourages a healthy skepticism toward the media hype surrounding Mars as humanity prepares to venture forth. The Page 99 Test: Life on Mars.